I've been part of this forum since 2006 when I first got my glider and I still have the little chap with me. 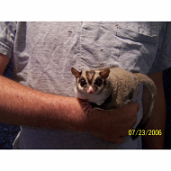 He is a single glider who's not been neutered, but has a good temperament. He eats well and he's never had any medical issues. Since he's quite old (I know they can they live up to 12-15 years of age and sometimes more), I'd just like to know if there's anything I should be more careful about in terms of handling or caring for an older glider. He's used to spending more time in his cage then out, but I want to get him to hangout outside more often. Would changing his routine be okay at this age? We don't hear about many seniors. All of mine made it to their teens, and I considered myself very lucky. If you are simply wanting him with you more, how about a bonding pouch around you neck when you are watching tv? That way you can even place your hand inside so you can pet him during your favorite shows. If he is used to your handling him, I have no doubt he would love this as well. I would watch and see if he comes out of his nesting area during the day in his later years. Otherwise I agree with Karen's suggestions of just going with the flow of what he wants to do. If you do try anything different in his routine or start a new one with him, just watch how he reacts to any change. I feel blessed to have had senior babies in my life and have a special place. But is very hard in knowing their time is short and watching changes. I have a few seniors that are still with us. I agree with Karen and Art. Watch him to see if the changes you make in his schedule stress him out. If it stresses him out I would discontinue doing it. My little Fevy will be turning ten next month. He is also a singleton, but at this point he's very set in his ways. I think with old pets in general, it's more difficult to change their habits. I like the idea of the bonding pouch as a good way to start carrying him around. Fevy is a stubborn old man at this point, so there's no sense in teaching him new tricks.